Yo ho, you scurvy dogs! The brigands and bastards of Alestorm set sail once more on the seas of pirate power metal with their third release Back Through Time. Expect more tales of sea battles, shipwrecks, midget and wenches and, of course, the swilling of gallons of ale and rum from this lot of Scottish buccaneers. There's really nothing novel about this sub-genre of metal, and Alestorm makes no apologies for their style, noting its roots in Germany's Running Wild in the song Scraping the Barrel. Otherwise, expect classic melodic heavy/power metal treated with a Scottish/Irish flavor from 'fiddle' supplied by keyboards. Actually, vocalist and keyboard player Christopher Bowes often plays a 'keytair' in videos and live shows. That's not really 'metal' but we won't hold it against him. Back Through Time, Shipwrecked, and The Sunk'n Norwegian over this straight up metal style. But then there's the speed metal of Buckfast Powersmash; whatever that is? And speaking of strange, scratch you head, songs, there's Midget Saw. I'm supposing its more of Alestorm's humor, but I wish I had the lyric sheet. What would be a pirate metal album without one song about the glories of drink and flagrant drunkenness. Rum hails the glories of, well, rum as the finest concoction for inebriation. Chaos and mayhem continue to the end wrapping up with a battle with death-dealing giant squid, Death Throes of the Terrorsquid. 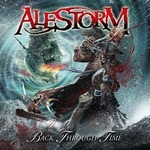 It's an epic tune of preposterous pirate power metal displaying Alestorm at their most swashbuckling best. I'm sure most heavy metal purists (and those of the modern sort) might dismiss Alestorm so-called 'pirate' metal as pomp and gimmickry. Whatever. Back Through Time sure is a lot of fun. So raise a pint of your favorite brew, Matey, and hail Alestorm. Recommended. I'm sure heavy metal purists might dismiss Alestorm's so-called 'pirate' metal as pomp and gimmickry. Whatever. But Back Through Time sure is a lot of fun. So raise a pint of your favorite brew, Matey, and hail Alestorm.